A pair of star-crossed lovers fall in love. Sorry, I couldn’t help myself. But that’s the basic premise of the story. 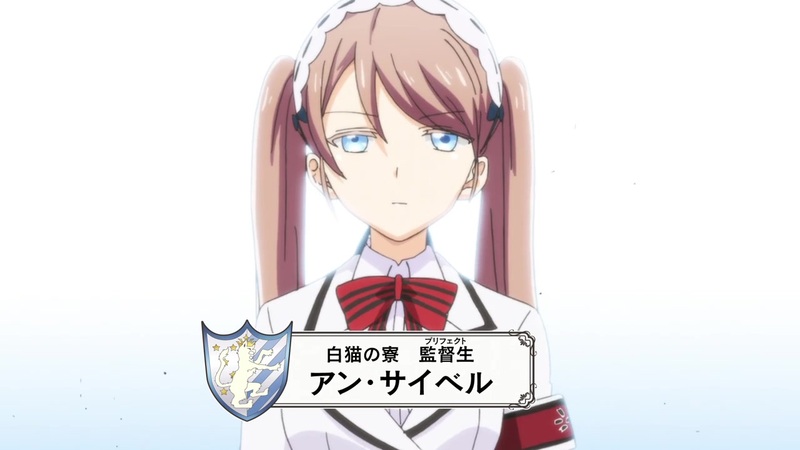 So, Boarding School Juliet is basically a modern day retelling of Romeo and Juliet set at a prestigious academy called Dahlia Academy. Instead of the Montagues and the Capulets, however, we’ve got the White Cats Dorm made up of students from the Principality of West and the Black Doggies Dorm from the Eastern Nation of Touwa. Now, these two nations have been warring for ages and even the students have brought their bitter rivalries into the academy with full on fights breaking out every day. At the head of these dorms is Juliet Persia and Romio Inuzuka who wind up falling in love with each other. But I’m rushing myself, so let’s begin this tale with a full recap of what happened in the first episode. Okay, so the story begins with a fight about to break out between the White Cats Dorm led by Juliet Persia (Ai Kayano) and the Black Doggies Dorm led by Romio Inuzuka (Yuuki Ono). As the two dorms fight for supremacy, their leaders decide to challenge each other to a duel (cue cheers from the dorms). The narrator’s voice then comes on and sets the scene for the audience by explaining the basic plot (above). 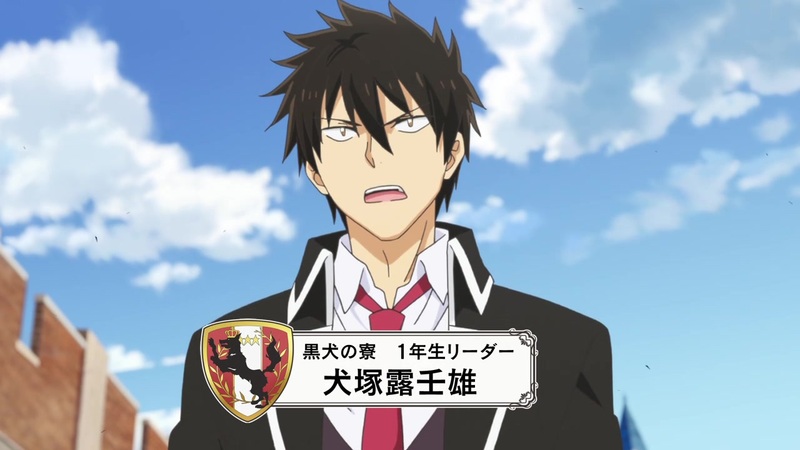 After the opening, the fight is still carrying on, when Scott Fold (Hiroshi Kamiya) offers to take Juliet’s place while vowing to protect her life. Seeing this display, Romio gets infuriated and punches Scott right in the cheek right before lifting him up and getting sent flying by Juliet who boldly proclaims that she does not need protection. Juliet then catches Scott who fawns over her, but Juliet just ignores him and re-challenges Romio to come at her with everything he’s got. Romio though refuses on the basis that he shouldn’t be hitting girls, but Juliet gets upset because she thinks that Romio is pitying or looking down on her. 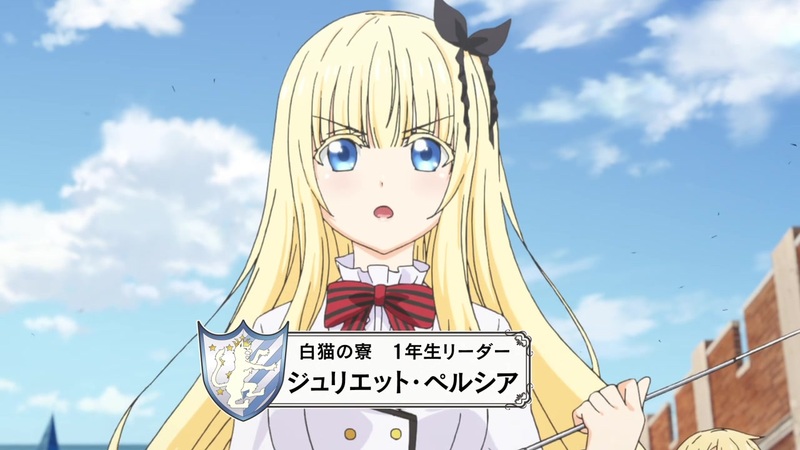 But, before the battle can get under way again, a voice calls out to the group and they turn and see the representative prefect of the White Cats Dorm, Anne Sieber (Sumire Uesaka), surrounded by her subordinates calling for the fighting to end. Romio initially refuses but then Anne states that she will get the Black Doggies representative prefect into this too. Fearing their prefect, the Black Dogs bend down to her will and both parties stop fighting and walk away. As Juliet is about to leave, she promises to crush the Black Doggies next time and Scott offers a personal one to Romio. Hasuki Komai (Ayane Sakura) labels Scott an idiot, but Romio gets infuriated and stares at Scott as he chases after Juliet. Later that morning, all of the 1st year students gather in one of the Black Dogs classrooms complaining and arguing about the result of the fight. 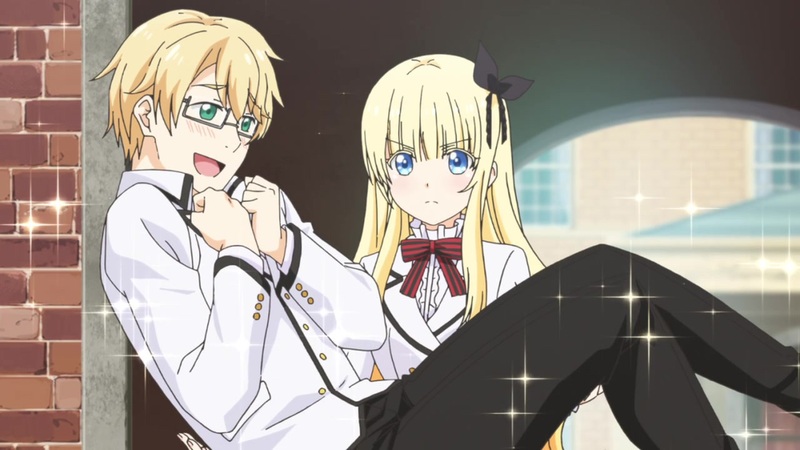 When the classmates cheer on Romio to beat Juliet, Romio doesn’t listen and winds up worrying Hasuki. As Hasuki offers to cheer him up in a seductive, the two get glared at by both the boys and girls for different reasons which causes Hasuki to joke it off. But alas it for not, as one of the other classmates points out that Romio has already left the room as a certain trio watches on. Outside the classroom, Romio starts beating up on the brick pillars, completely frustrated. He then recalls how he and Juliet have both been fighting since elementary school and how it has continued into middle and high school.With tears of irritation in his eyes, utterly admits in his mind that he is completely in love with Juliet and starts going on a tirade about how he doesn’t want to fight, but to protect her. He then recalls how Scott vowed to protect her and decimates the pillar out of jealousy. Fed up with his situation, Romio decides to outright confess to Juliet, but then worries what he should do if he confessions flops. Thinking about it, Romio decides to do some recon at the gym where Juliet normally practices at. At the gym, Juliet is wiping the floor with one of the other White Cat students at sword practice. After she wins, Juliet thanks the student for the match and Scott comes up to her with a towel to wipe her sweat off on. Accepting the towel, Scott compliments Juliet’s skill, but Juliet comments that she still has a long way to go and remarks that she wants the strength to change the world. Juliet continues that she knows that she often gets laughed at for it, but that’s why she can’t afford to be underestimated by anyone. Suddenly remembering how Romio held back on her this morning, Juliet gets pissed and rips up Scott’s towel. Immediately realizing what’s she has done though, Juliet panics and promises to get him a new one. Meanwhile, Romio is watching all this through the gym window. Despite not being able to hear everything, Romio instantly understands that Juliet is pissed off at him and starts banging his head against the wall wondering if he has a chance in hell with her. Suddenly, Romio hears the sound of two White Cat guys dragging and carrying some Black Doggie grade schoolers towards the gym. Hearing the kids cries, Romio runs out to stop the two bullies, but then Juliet and Scott appears from the gym so Romio races back to hide. Asking what happened, Juliet is told by the two guys that the kids graffiti-ed the word “Idiots” onto the door of their dorm, so they were thinking about giving them payback. Thinking, Juliet asks the kids why they did such a thing and one of the kids reply that they did it as payback because someone from the White Cats Dorm called the Black Doggies “weak” and asks if she has a problem with it. Angry by the kid’s disrespectful tone, one of the guys yells at them and shoves them to the ground. Romio runs out to help, but then Juliet speaks out and said that the kid was about them being weak. She then badmouths the kids while lecturing them on what real strength is, which angers the kid and causes him to try and tackle Juliet. Taking the tackle head on, Juliet holds the kid and states that this is what strength is – to have the courage to face your opponents head on. She then wipes the kid’s bloody nose and tells them to go home. She further cautions them that there will be no pleasantries next time and she’ll take them on any time. Upset because Juliet is letting the kids off with a warning, the two guys get angry and tells her to punish them, but Juliet just removes her hair tie and lectures the two bullies about beating up on little children instead; reminding them that as members of the White Cats and as nobles, they must keep themselves to a higher standard than the Black Doggies; not sink to their level. Watching Juliet’s gallant figure, Romio reminds himself of why he fell for her and renews his determination to confess to her. However, what he doesn’t notice is that everyone has finally noticed him and when he does notice, everyone gets ready to attack him. Panicking, Romio declares that he didn’t come to cause trouble, causing Juliet to ask why he came. Romio then makes an awkward attempt to confess, but he can’t utter the words and ends up declaring that he was here to complain before running off at full speed. Seeing Romio run off, Juliet is furious that he is teasing her again and starts kicking the ground despite Scott’s protests. While Romio is still running away cursing his own cowardice in his mind. From a bench, the trio from earlier, Eigo Kohitsuji (Hiro Shimono), Kento Tosa (Yoshimasa Hosoya) and Chizuru Maru (Tomokazu Sugita) are watching what has just happened. Kento wonders what the hell Romio is up to, bu Eigo alerts him that Juliet is coming out of the gym and is likely walking back to the dorms after practice alone now, meaning that this is their chance to strike. Kento reasons that taking her out now will make crushing the White Cats easier, so Eigo gives him a mask to hide his identity with. From the shadow of the trees, Chizuru just evilly glares while complaining about Romio’s half-hearted methods and playing with a box cutter knife. A little while later, Juliet is walking by herself back to the dorms, when who should appear but Eigo and Kento (who don’t even bother to hide their presence). As they go to attack her, Juliet confronts them, but becomes completely stupefied when sees that are blind and moving around like morons from wearing white bags with no eye holes. Juliet immediately determines their identities and asks if they need something. Instead of answering, the two rip off the bags and begin to attack Juliet, however, she easily kicks their butts. But just as the battle turns to Juliet’s favor, Chizuru blind sights her with some pepper spray and she gets restrained by Eigo and Kento. Approaching Juliet, Chizuru orders Kento to shut her mouth with tape as he pulls out his box cutter and slashes open Juliet’s blouse revealing her bra with the intent of humiliating her. Boasting about how weak she is, Chizuru stares as Juliet begins to cry. Suddenly, Romio appears from nowhere and jumps in, tackling Juliet to the ground and away from the trio. Surprised and wondering what Romio is up to, the trio is alerted by Kento about students approaching and the trio withdraws for now. At the spot where Romio and Juliet has landed, Romio slowly gets up and realizes that he is in a very bad position. As Juliet starts waking up, she calls out to Romio who replies back that its him. Realizing the state she is in, Juliet moves away from him blatantly scared and Romio starts freaking out in his mind wondering if Juliet thinks that he was the one who attacked her. Losing restraint of himself, Romio immediately goes to yell out that he wasn’t one who assaulted her, but stops because of Juliet’s sad tears. Picking herself up, Juliet runs off leaving Romio to collapse on the ground with the thought that he has lost any hope of confessing to her now. 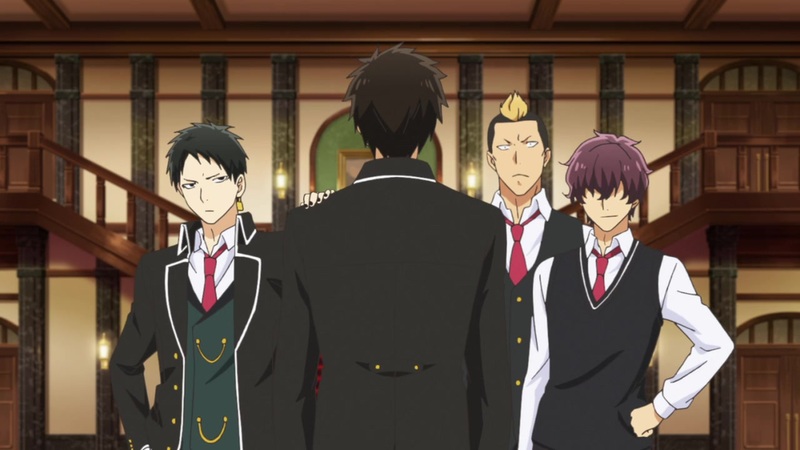 Later that night, Romio returns to the Black Doggy Dorm where he is confronted by the trio and taken outside. As Chizuru demands an answer for why he rescued Juliet, Romio immediately cleans their clocks and yells at them for putting him in the “toughest pinch of his life.” Sighing, Romio lets go of Chizuru and looks up at the White Cat Dorm degrading himself further. Suddenly an arrow with a message attached hits Chizuru smack in the head, causing blood to gush out. Reading the letter, Romio reveals that Juliet is calling him out and wonders if it is a challenge from her. Going to the place indicated in the message, the fountain in the plaza, Romio’s concerns are confirmed to be right when he sees Juliet with two swords. Waving the swords around, Juliet asks Romio about whether tackling her was as a means to assault her, save her or mock her and if it was to assault her then she’ll slice him to pieces with the sword in her right hand. Romio freaks out wondering where she got those swords, but then sees Juliet drop her sword. Lowering her head, Juliet then asks for the reason why Romio saved her even though they are enemies. Hearing her pleas, Romio thinks to himself about how he can’t reveal that its because he’s in love with her because he’s not ready to confess yet, so he decides to come up with a fake answer. Thinking, Romio then sees Juliet crying as she suggests that if he did out of pity then it’s the same as attacking her and it stings because she doesn’t want anyone to pity her or see her as weak, let alone Romio. Suddenly, Romio realizes the reason why she was crying back then after her assault in the rose garden and loudly yells out that it’s not because he pities. Upset, Juliet angrily yells out asking why he doesn’t treat her seriously in fights and suggests that he is making fun of her which causes Romio to recall one particular fight back when they kids where they both got caught out by the teachers and were later lectured by them. As young Romio looks at Juliet, he listens to the teacher lecturing her about having more self-awareness as a noble. Back in present, Romio realizes the reason Juliet desires strength is to change the noble class system in her nation where the heirs of nobles are always male while the daughters are married off to other nobles, so that she can live her life freely while not being looked down on anymore. Reveling in that thought, Romio realizes what an idiot he’s been because he’s been hurting her all along and challenges Juliet to a serious fight. Juliet thanks him and tosses a sword to Romio and the clash of swords begins. However, during the fight, Romio starts declaring his love for Juliet and asks her out while swinging his blade. Utterly disturbed and embarrassed, Juliet starts attacking him again, shouting and yelling all sorts of reasons why they shouldn’t date. But, Romio rebuts by boldly declaring that if he is by her side then he can change the world for her which touches Juliet’s heart……at first. But then she shoves Romio into the fountain and utterly soaks him. As Romio gets up and asks “What was that for! ?” Juliet walks up to him and calls him an idiot for trying to do something so ambitious by himself. Averting her eyes, Juliet quietly declares that she’ll help him out with it. Hearing this, Romio hesitantly asks “Does this mean…..?” But, before he can complete this question, Juliet agrees to go out with him on the condition that he can prove that he can change the world for her. In complete shock, Romio begs Juliet to say it again. Juliet tries to, but gets nervous and cries out her refusal. However, her acceptance still hits the mark as it makes Romio bawl like a baby as he declares how happy he is because he thought that she hated him. Juliet declares that she never hated him, which causes Romio to ask if it means that she likes him. Juliet declares that she doesn’t know, but insists on keeping their relationship an absolute secret otherwise…..but before she can finish her threat, Romio agrees to her terms and tells her that its fine as long as he can be with her then its fine with him. The two then wish each other well. The next day, Romio races to try and speak with Juliet on the walk to school, but Juliet pretends to ignore him which causes Romio to freaks out in his mind wondering if yesterday was a dream. However, he then realizes that the real reason is that there are people around as Scott and Hasuki gleefully comes running to them. As Juliet walks away, she secretly giggles as Romio chases after her. 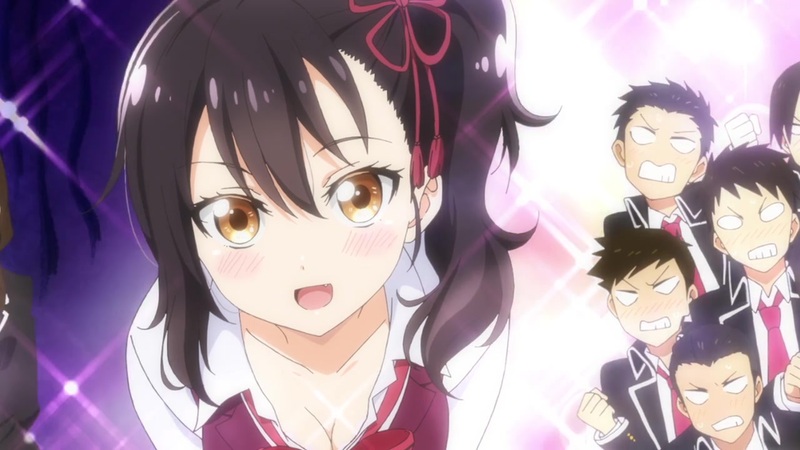 Boarding School Juliet is a really funny romantic comedy. From the first get go, we can see that the anime is going to be a favorite this season. The show has been well-thought out and does a decent job at world building since they don’t get right down to business. The comedic and romantic elements really flow well together and the animation is of excellent quality with the anime’s character designs being amazingly top notch. 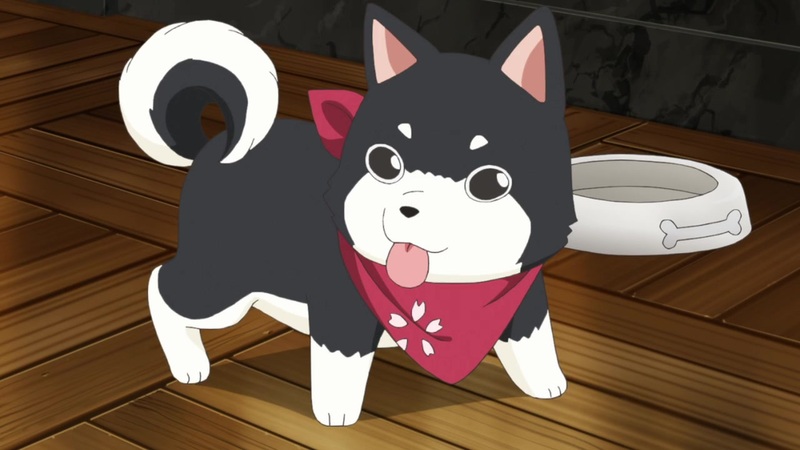 The idea of equating the dorms to cats and dogs is hilarious which becomes even more funny when the viewer sees that there is a literal black puppy at the Black Doggies dorm. As for our main couple, I really adore Romio and Juliet. They are just so different from other interpretations of Romeo and Juliet. Romio is just one of those adorable guys who is really sincere and tries hard, but is so socially awkward when it comes to romance that its really funny how he procrastinates and berates himself in his mind. 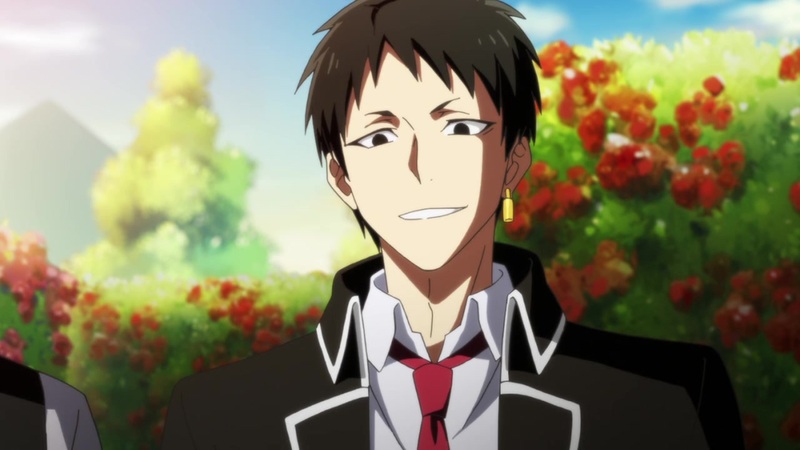 Although his clumsiness is what makes him all the more lovable…..like a puppy. On the other hand, Juliet comes together as a very strong and noble, independent woman who is trying to make her way in a man’s world. While she presents herself as very strong to others, she has a hidden weak side which brings outs some very cute looks. The rival dynamic between them is really interesting too as they are both opposites, but they are also similar in a way with them being childhood rivals. With regards to other characters, I really love how Hiroshi Kamiya’s character is basically Juliet’s fanboy and servant like in Monochrome Factor and I’m really interested in finding out more about Anne. The trio of Egio, Kento and Chizuru seem to the main comedy trio of the show, so I’m expecting a lot of antics where they’ll get beat up over and over again. Chizuru’s design looks really interesting with that lock piercing in his ear and his sadistic personality, so I think he is the Mercutio of the story. Hasuki so far appears to be an alright character in the way that she unashamedly tries to seduce Romio by making cute poses, but I really want to see her get serious when she realizes that there is a relationship between Romio and Juliet. One thing that I do find absolutely appealing about this show is the use of monochrome shades as definite symbols in this show. These two shades of black and white not only highlights the Romio and Juliet, but offers a commentary on the whole notion of binary opposites and how they either compliment or work against one another. For Romio and Juliet who are clearly meant to show about how binary opposites can work together, Black and White also represents the driving forces that could try to break them apart. These shades not only represents their dorms but also their nations (East and West), their upbringing (noble, commoner), their fighting style (cats and dogs) and the flaws in their own personalities. In Romio’s case, its more about becoming more confident with his feelings and being more aware of others, while for Juliet, her issue is more about opening herself up and being not afraid to show her own weakness. One thing that I will say about what I disliked about this show is how they showed Juliet getting her shirt sliced opened. As a follower of shoujo manga, I do understand the need for these type ‘damsel in distress’ tropes in a romantic comedy, but I just don’t like how they overuse this trope over and over again. So, I’m hoping this is just a one time thing for the trio. Music-wise, I can’t really speak on the ending theme song because there wasn’t any, but the opening theme song is really a lovely, pop, love song which highlights the other love rivals and shows the relationship between Romio and Juliet as the future battles they’ll potentially face. Overall, this anime looks to be a rather entertaining and funny show so far and I’m definitely gonna keep on blogging this show for the season. I’m genuinely looking forward to all of the future episodes of this and I hope that you will too!